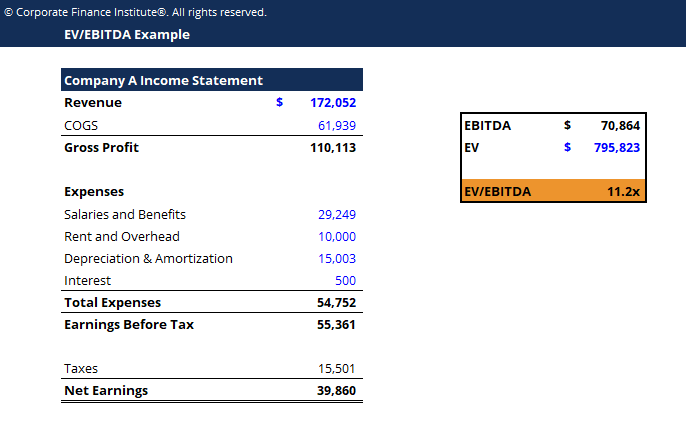 This EV/EBITDA template guides you through the calculation of EV/EBITDA using figures from an Income StatementIncome StatementThe Income Statement (or Statement of Profit and Loss) shows performance from operations of a business. The financial statement begins with revenues and. EV/EBITDA is a ratio that looks at a company’s Enterprise ValueEnterprise ValueEnterprise Value, or Firm Value, is the entire value of a firm equal to its equity value, plus net debt, plus any minority interest, used in valuation. It looks at the entire market value rather than just the equity value, so all ownership interests and asset claims from both debt and equity are included. (EV) and compares it to its Earnings Before Interest, Taxes, Depreciation & Amortization (EBITDAEBITDAEBITDA or Earnings Before Interest, Tax, Depreciation, Amortization is a company's profits before any of these net deductions are made. EBITDA focuses on the operating decisions of a business because it looks at the business’ profitability from core operations before the impact of capital structure. Formula, examples). This ratio is one of the most common metrics for valuation when comparing the relative value of different businesses. The ratio of EV/EBITDA is used to compare the entire value of a business with the amount of EBITDAEBITDAEBITDA or Earnings Before Interest, Tax, Depreciation, Amortization is a company's profits before any of these net deductions are made. EBITDA focuses on the operating decisions of a business because it looks at the business’ profitability from core operations before the impact of capital structure. Formula, examples it earns on an annual basis. This ratio tells investors how many times EBITDA they have to pay, were they to acquire the entire business.